The Sun Fire 280R is a rack-optimized server that provides the reliability, availability and scalability you need to run your applications. Memory Total of 8 DIMM memory slots available 256- or 512MB; or 1-GB expansion (8 GB maximum) Note: Install DIMMs in groups of four. Operating System Baseline Solaris Operating System for UltraSparc 1.2GHz CPU = Solaris 8 2/02 & Solaris 9 12/02. Preloaded Solaris Operating System for UltraSparc 1.2GHz CPU = Solaris 8 12/02 & Solaris 9 12/02. 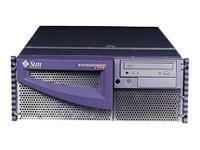 For pricing on new or used Sun Fire 280R servers, upgrades or parts, please contact Vibrant sales at sales@vibrant.com or call 888-443-8606 or 952-653-1700.